Using Peggy Martin's 5 Steps to a 5 Review book, students will complete graphic organizers for each period to begin reviewing. Page 1 will have them place the vocabulary terms found on the first page of each chapter in the review book in thematic categories to have them organize terms into relevant groupings. 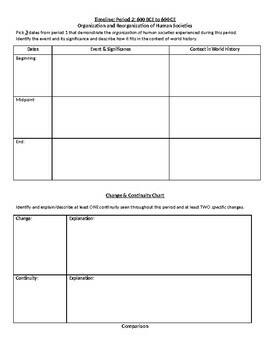 Page 2 will have students analyzing periodization skills and practice identifying significant CCOT concepts. 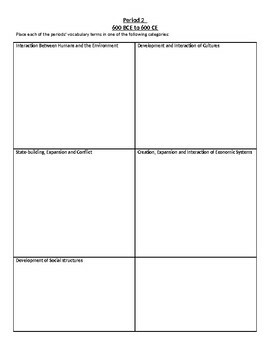 Page 3 will ask students to practice comparison skills of major topics within each period. Page 4 will have students practice causation skills by having them analyze significant historical developments. 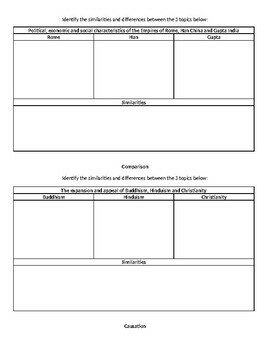 Examples have been provided on pages 2 and 4 where students have asked the most questions and I have needed to make the most clarifications. 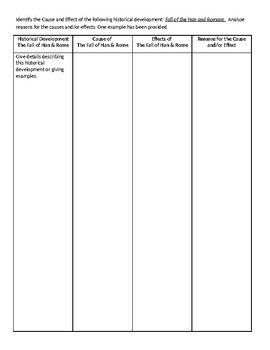 ***These worksheets are meant to get students to practice the historical thinking skills while reviewing content independently. This work is assigned to each student independently and checked for completion. Questions arise which are discussed in class or during extra help.